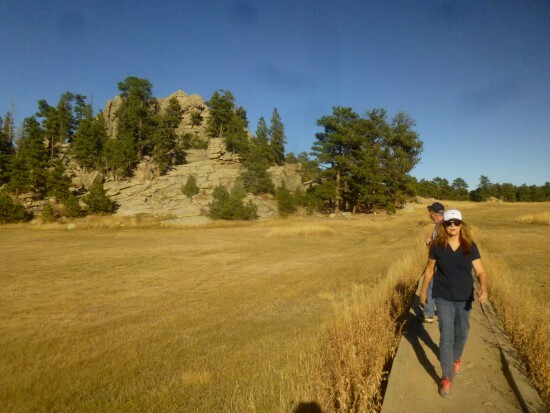 Alderfer/Three Sisters Park has the look and feel of a local park, populated mostly by trail runners, bikers, dog-walkers, and Evergreen residents on their evening strolls. (On the Saturday evening I visited, a gaggle of high-school girls were filming a skit for their Spanish class.) 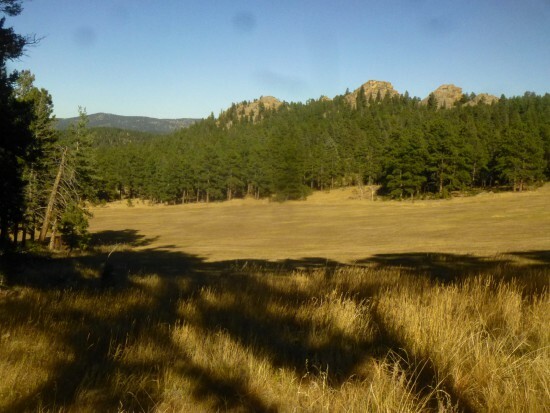 The rolling foothills and pine-lined meadows at Alderfer/Three Sisters are by no means unique, but the park does boast the highest ratio of trails per acre (15 miles in 770 acres) among the Jefferson County Parks. 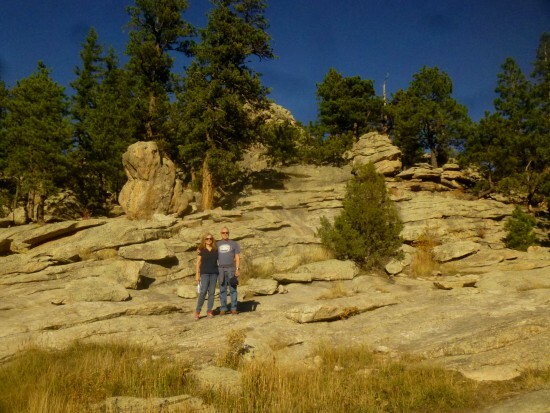 The rocky granite ridge—including the park’s namesake, the Three Sisters formation—is also a draw for local rock climbers. 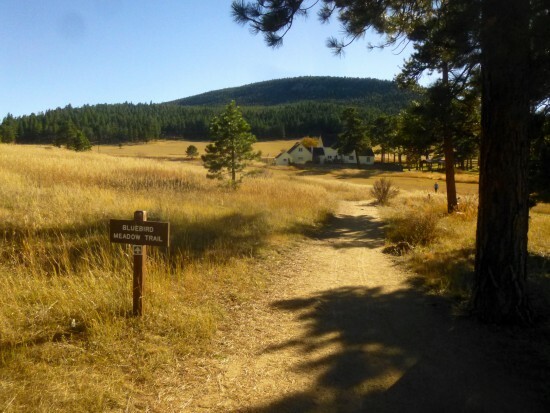 The quick and easy Bluebird Meadows-Homestead Trail loop, near the park’s western fringe, begins and ends at the Alderfer family ranch and offers a nice mix of terrain, including open meadows, ponderosa pine forest, and great views of the Three Sisters and beyond. E.J. and Arleta Alderfer were neither the only nor the first residents to call the foothills west of Evergreen home, but as beneficiaries of the lucrative fur business pre-WWII, they may have been the richest. Like many living in the area, the Alderfers bred and raised silver foxes, producing pearly grey hides that often sold for $1,000 each. Though the fur business declined after WWII, the Alderfers’ 1894 ranch home (they were actually the 2nd owners) remained. Eventually it was purchased, like other ranches in the area, by Jefferson County in 1984. 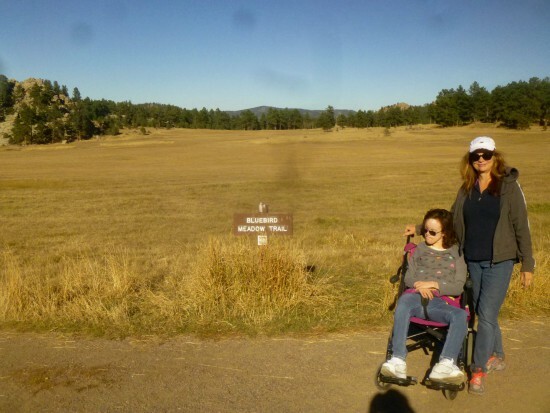 For handicapped visitors, at least half of the loop is wheelchair-accessible—though it is not traditionally advertised as such. The tightly-packed dirt path around Bluebird Meadow is largely devoid of obstacles, though strollers pushing on around the Homestead Trail will have more trouble (tree roots, wooden steps, jagged rocks). We managed both with a wheelchair, but I would not recommend doing so on the Homestead section. The route begins by cutting east through Bluebird Meadow, passing the old Alderfer barn and home on the right. In the spring, Bluebird Meadow is sprinkled with wildflowers, from daisies to the purple Rocky Mountain Iris. On the brisk October day we hiked, however, there was little to be found beyond the yellow-tinted tall grass. 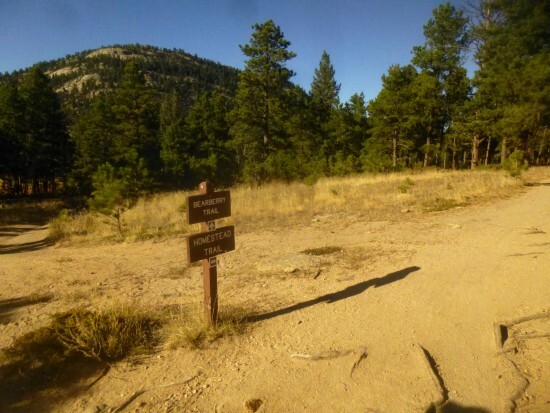 After turning left onto the Silver Fox Trail (a right turn would take you toward the Ponderosa Trail and the east parking lot), the sound of buzzing curs on Buffalo Park Road gradually dissipates. 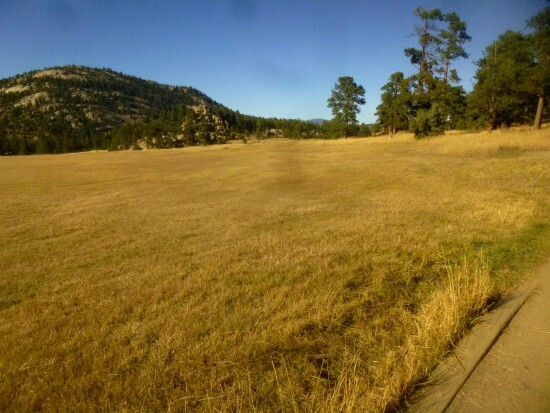 Pockets of shade offer the first up-close look at the ponderosa pines that predominate across the park, and a glance backwards reveals a nice view of Alderfer Ranch and 8,536-foot Evergreen Mountain beyond. 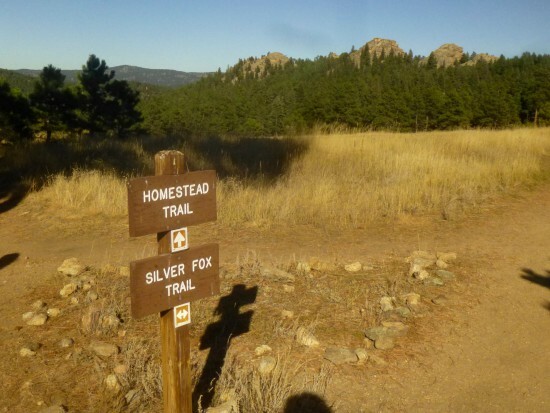 After about 1/4 mile, hikers on the Silver Fox Trail reach the first junction with the Homestead Trail on the left. 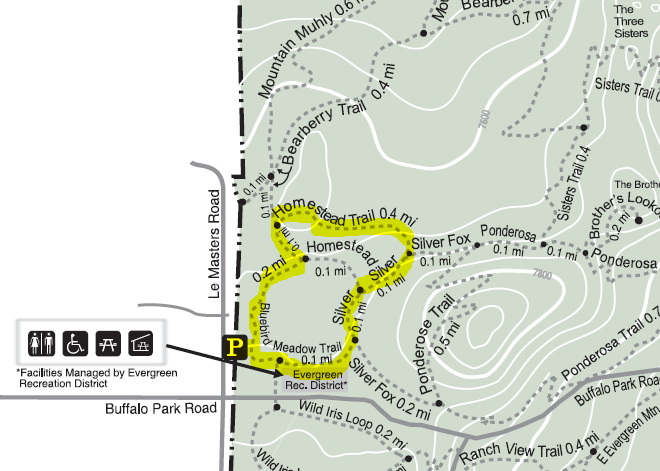 This route connects back to the Bluebird Meadow Trail, completing the circle around the open space. 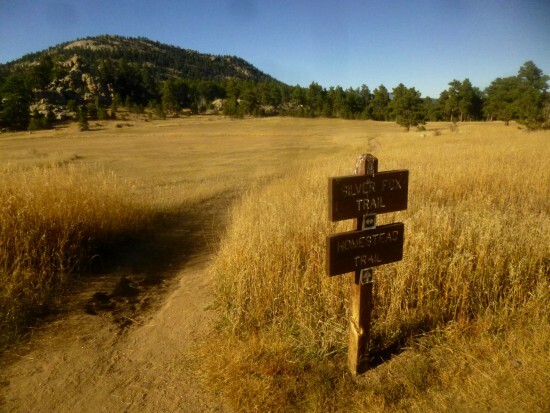 But there is also another junction with the Homestead Trail 1/10 mile farther—taking a left here offers a slightly longer jaunt, as well as an opportunity to pass through a wooded area with some interesting quartz granite formations. Just before turning onto Homestead, there is a tremendous open view of the Three Sisters (and the Brother) to the east. This is perhaps the best vantage point of the Sisters in the park. The Homestead Trail ducks into the trees for 4/10 mile, passing the backside of the playground of stone visible across the meadow from Alderfer Ranch. 7/10 mile into the hike, the dirt path intersects with the Bearberry Trail, which continues for more than a mile off to the right. 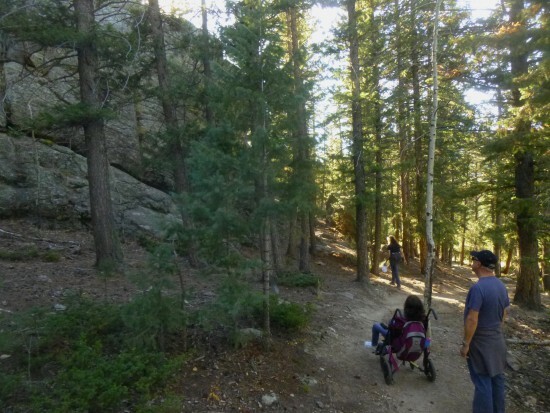 Turn here as well for access to the Mountain Muhly Trail, a hike among the pines that crosses Buffalo Creek and skirts the slopes of Elephant Butte (8,405’) before looping back to the Bearberry Trail. Stay left at this intersection to head back toward the meadow and the parking lot. 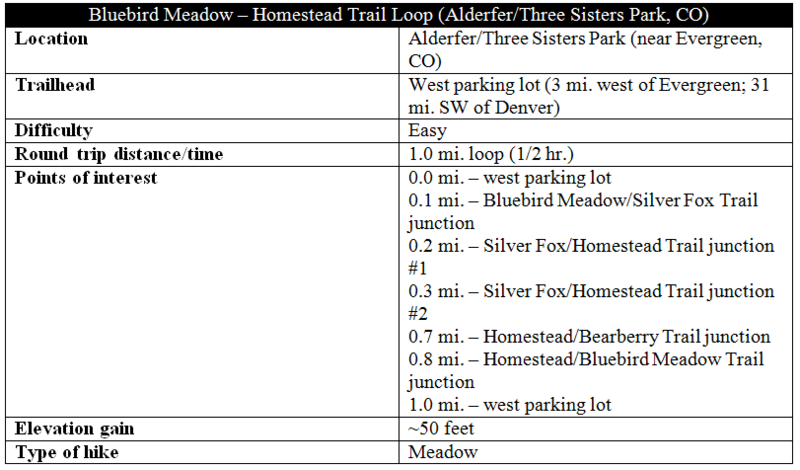 Alderfer Ranch will quickly reappear, and it is another 1/10 mile to the junction with the Bluebird Meadow Trail. Immediately to the left, check out the towering metamorphic rock pile, a protruding chunk of quartz monzonite that is definitely climbable (probably a lot of fun for kids). 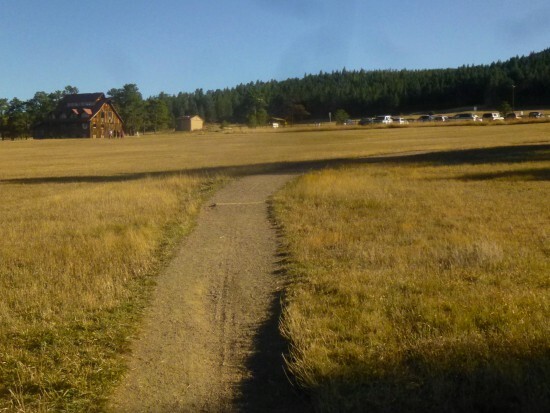 The final leg of the hike cuts across the grassy field on the Bluebird Meadow Trail en route to the parking lot, reaching Alderfer Ranch and the public toilets after 0.2 miles. The loop—great for families with children (and maybe the disabled; see disclaimer above)—runs about 1 mile in total. 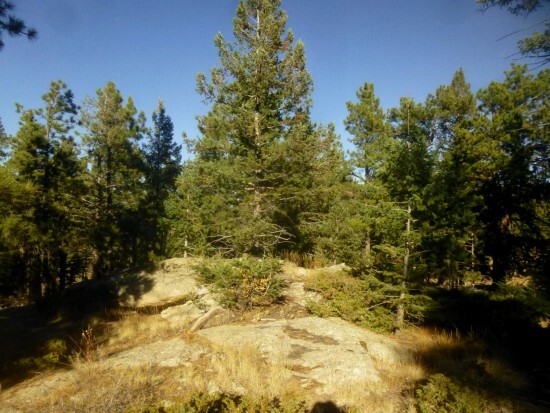 This entry was posted in Colorado, Easy Hikes, Jefferson County Parks and tagged Alderfer Ranch, Alderfer Three Sisters Park, Bluebird Meadow, Colorado, Denver, Evergreen, Homestead Trail, loop hike, meadow, Silver Fox Trail, wheelchair-accessible. Bookmark the permalink.